True Home Cinema is closer than you think Create a spectacular cinematic experience in your own home. Available in a sleek, contemporary black or white finish that makes a stylish addition to any interior, the VPL-HW65ES Home Cinema projector lets you enjoy your favourite movies at their best in 2D or 3D. Advanced SXRD panel technology delivers fabulous Full HD images with impressive 1800 lumens brightness and high 120,000:1 contrast ratio that always look clear and sharp, even in daylit living rooms. Light, compact and easy to set up, the VPL-HW65ES fits neatly into any home theatre or living room, with quiet fan noise that won't disturb the show and a front-facing exhaust port for extra installation flexibility. 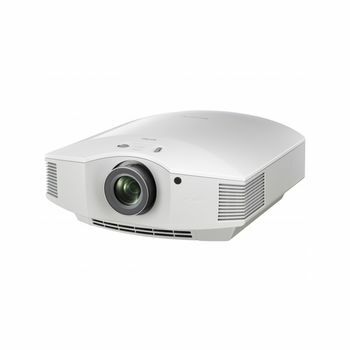 The projector's long-lasting lamp is rated for an extra-generous 6,000 hours operation (in Low Mode), for fewer interruptions and reduced maintenance costs.